Hi–I’m Sheryl Lazarus, and this blog shares the story of my great aunt, Marian Solomon. When cleaning out my parent’s attic, I found a trunk full of Aunt Marian’s items, including a handwritten cookbook and lots of Women’s Army Corps (WAC) memorabilia. Great-Aunt Marian Solomon lived on a farm in central Pennsylvania, and cared for her parents until they died. 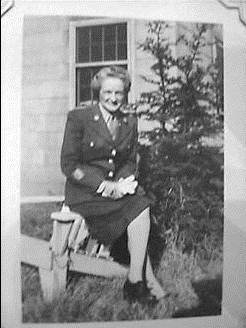 She then joined the Women’s Army Corps (WACs) during World War II at the age of 45. 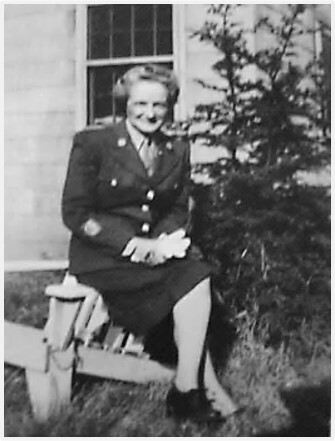 She remained in the WACs for almost 20 years until she received a medical discharge when she was in her mid-60s. When I first found Aunt Marion’s items, I had little interest in them because I barely knew her; but something kept pulling me back to her memorabilia, and I’ve recently realized that they contain an important story that needs to be told. Her voice had been nearly silenced by time–but I’ve discovered that I have pieces of the story of a fascinating woman, a feminist in her own way. . . a woman with an 8th grade education, who reinvented herself in her mid-40s as a WAC. I hope that you will join me in my journey as I share what I have–and do some additional research to learn more about her, the WACs, and the times. This is my second family history blogging project. My first one was A Hundred Years Ago. My grandmother kept a diary from 1911 to 1914 when she was a teen living in central Pennsylvania. On that blog I posted the diary entries and background information a hundred years to the day after she wrote them. Yeah! It’s wonderful to know that you’re excited about my latest blogging adventure. Did you save and print the 100 year blog? This is fantastic, Sheryl! What wonderful treasures you’ve inherited and are willing to share with the rest of us, thanks!! I am very fortunate to have these items, and enjoy sharing them with others. I really enjoy blogging, and it is a privilege to share them. The era you report was part of my childhood. During the WW2 days, I saw first hand many of the things you say your aunt experienced. I’m looking forward to getting your insights and perspectives on future posts. I have not seen a recent blog from you. I hope all is well and you are just taking a break. You do such great work on your blog. Thank you for your kind note. All is well and I’m enjoying my blogcation–though I’m starting to really miss blogging. I’m currently thinking about what I want to do next–and expect to see me back in the blogsphere sometime in the fall or winter. Stay tuned. . .